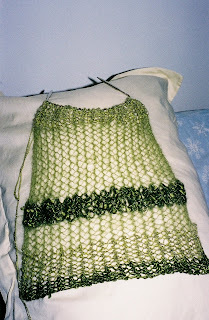 Remember all that olive green yarn I bought? This is the scarf I"m making with it. I'm very pleased with how it's turning out. The Trendsetter Dune (fourth yarn from the bottom) is a little difficult to work with because it's a double-stranded, textured yarn, but it looks amazing. I should have this scarf done about the time that it gets too warm to wear it, but at least I'll have it ready for next fall.